There are over 56,000 bars and nightclubs in operation in the US, according to data from the CHD Expert foodservice database. This should come as no surprise, as bars and nightclubs are cornerstones of American nightlife. Those 56,000+ bars and nightclubs make up 8% of the total US restaurant landscape. Following a trend in the overall American restaurant landscape, the majority of bars and nightclubs are independent – a whopping 99%. 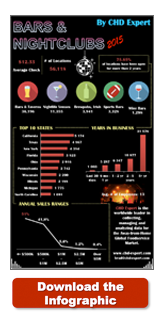 Bar and nightclub data paints an interesting portrait of the nightlife scene in the United States. Over 75% of bars and nightclubs have been open for more than two years. The landscape comprises five segments: Bars & Taverns, Brewpubs & Irish Pubs, Sports Bars, Nightlife Venues, and Wine Bars. Bars & Taverns make up just over 64% of the bar and nightclub landscape, followed by Nightlife Venues (20%), Brewpubs & Irish Pubs (7%), Sports Bars (6%), and Wine Bars (2%). You can also meet with us at the 2015 Nightclub & Bar Show, where CHD Expert will present a breakout session entitled, “Bar Data: Keeping a Close Eye on Your Competition” on April 1. We’d love to have you in the audience and speak with you at the show. If you’d like to learn more about foodservice data and how it can impact your business, please email [email protected]. Or, feel free to give us a call.